Since you’re already knee-deep in numbers, tax time is an ideal point to take an honest look at your freelance business—not just the top-line income number, but a client-by-client breakdown. The numbers don’t lie, and they could be flashing a warning signal that it’s time to diversify your freelance business. As suggested in last week’s post, client diversity is your best business defense against a freelance client bankruptcy or financial trouble, but there are other reasons to take a dive into the data. The chart at the top of this post illustrates my income by client from last year, pared down to the 19 accounts that were 1099-R level or above. My biggest client represented about 25% of my revenues, which is about as high as I’m comfortable with. Obviously, I prefer to keep that in check by increasing the other pieces of the pie as opposed to shrinking that one! Important: These numbers represent a snapshot of my business last year—definitely not a prescription for what your freelance business should look like. I recommend you take a quick break from doing taxes to produce your own chart, which you might find illuminating and motivational. Industry type. In a way, diversifying by industry type is a bit like spreading your stock portfolio into a variety of investments: You can limit your downside risk and position yourself to capitalize on rising markets. It’s easy to see what can happen if you don’t: I knew several freelance writers and designers who made more than six figures annually during the real estate boom of the mid-2000s by focusing on that niche. Real estate agents, developers, planned communities, and banks were shoveling money into marketing and advertising as fast as construction firms were shoveling dirt. After the crash, almost every one of those freelancers reverted to corporate careers, because their client base and prospective clients had been demolished. Service type. This is a little trickier, because it requires expanding your skill set, taking some risks, and convincing someone to take a chance on you. At some level, this will probably be forced on you, whether in learning a new software program, applying your talents to new creative functions or types of media, or adding project management, to name a few examples that could add value to prospective clients. Client type. In fact, this is two subsegments: 1) business size, i.e., cultivating a mix of small, medium, and large clients, and 2) the number of solid, ongoing clients that you work with. The advantages here come from volume and variety. (I’m easily bored, so the latter is particularly valuable to me.) Another benefit is that you’ll be exposed to new people with different networks, which enhances your chances of referrals. You have one or two really great clients who give you plenty of business. Telling you how to run your enterprise isn’t the objective of this blog, and the anchor-client formula may work for you. However, I feel obligated to repeat a concept my colleague Laura Poole shared at the Communication Central conference last fall: If you have only two clients, you’re one step away from becoming a dependent contractor rather than an independent contractor. While an anchor client may keep you safe in the harbor, they also keep you floating in the same place. An anchor client keeps you safe in the harbor…but also keeps you floating in the same place. You’re focused on one industry niche or service niche. There’s an endless debate in the freelance-o-sphere about whether you should focus on a niche or be a generalist. I believe it doesn’t matter. I know plenty of successful freelancers in both camps. Yes, being in a niche can help command a higher fee. But the caveat is the same is the same as the real estate example: No industry is always going to be on top. Technology and trends inevitably influence what people need and how it gets delivered. Even if you’re in a niche, you need to be alert to the hidden dangers. Beyond industries and services falling in and out of favor, you need to accept no client relationship will last forever—even if you do everything right. Your main contact can get laid off, quit, take a new position, retire, abscond to Tahiti, or die. A company can get acquired, merge, slash budgets, contract another freelancer, hire someone full-time, change strategies, or, based on the experience that sparked this post, go out of business. Since going freelance in 1999, I’ve had every single one of those happen (except the Tahiti thing). Although it was painful every darn time a client withered away or departed through no fault of my own, I was never worried about going out of business. Even a small step toward adding clients in different industries or service lines provides insurance for your freelance business. It also gives you additional leverage—similar to a go-to-hell fund—because you have options. Finally, the more people in your network, the more referrals you’ll receive. And who knows? Maybe one of those new clients could grow into a more lucrative piece of your pie when you sit down to pay Uncle Sam next year. In the comments: Do you have plans to add diversification to your freelancing in 2016? If so, what? 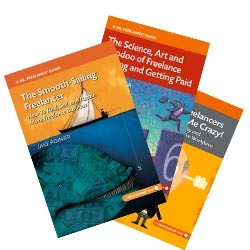 Want more ideas on running your freelance biz? 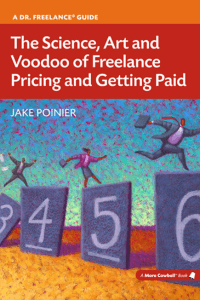 Grab your copy of The Science, Art and Voodoo of Freelance Pricing and Getting Paid (paperback or ebook) at Amazon or Barnes & Noble. Excellent points to consider, Dr. F, as usual. One thing that I am doing with a bread and butter client I have is diversifying within the scope of the work I do there now: I’ve offered related services they don’t have (yet) and services that expand their horizon ever so slightly. They have been uncharacteristically willing to at least consider them! Even if clients can’t or won’t accept suggestions for change, they may value you more once they see your ability to do more than your regular work there and to show them options they hadn’t thought of. Even a bit of unbillable work may lead to more income later; at worst, you’ve expanded your own work life and skill set. Within my niche (environmental science), I am reaching out to a broader mix of clients. I’m finding that companies with government contracts often need a writer/editor to help them meet their goals. My intent this year is to diversify and broaden my client base and stay busy year-round. Thanks, Jake, for the motivation. I’ve scheduled to make your suggested client pie chart tomorrow evening. Thanks, Vanessa. That’s a smart strategy, too, and it’s why longer-term clients are so beneficial—they have an understanding of your ability to do X and Y, and will be willing to give you a chance on doing Z. Much easier than convincing a new client that you can do Z without having a track record. I was very fortunate to have two large clients for about a ten-year span. Between the different divisions of the two companies, I had all the work I could handle. I didn’t have to market at all. But as you point out in the post, nothing lasts forever. Editors moved to other companies, the two companies themselves changed their strategies, and now I do substantially less work for them. I had to diversify and market to other clients. That’s when it’s toughest, isn’t it, John? You’re giving 100% to a few dedicated clients and the last thing you want to do is freelance “on the side” of your freelancing! This has been on my mind since early January. I went the niche route last year and don’t regret it at all. 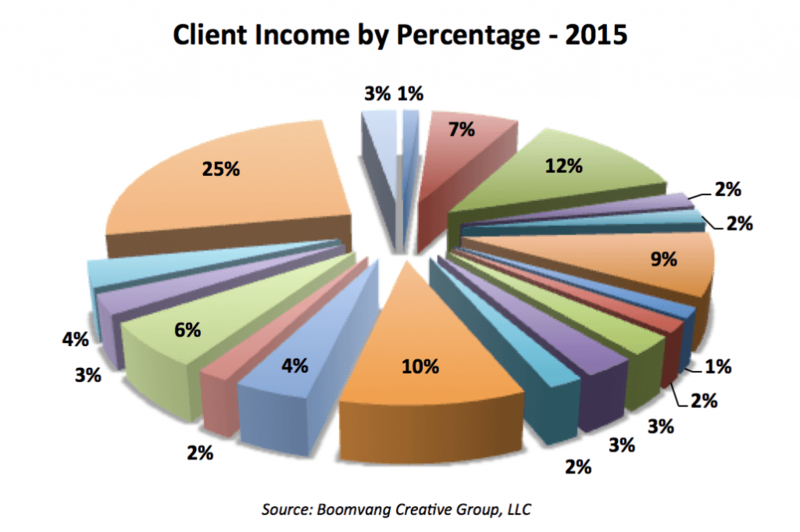 Generally, I try to have three “anchor clients” who provide enough work for me to have a fairly reliable base income each month,, then I add in what I think of as “bonus” clients. That way, if one of the anchors disappears, the bonus clients can either be converted or cover the gap until I find a new anchor. At the moment one of my anchors contributes about 4 times what the other two do combined. Not an ideal situation!